The CMMI Cybermaturity Platform provides a customized roadmap of risk-based priorities to help you increase your cybersecurity maturity and resilience more strategically. 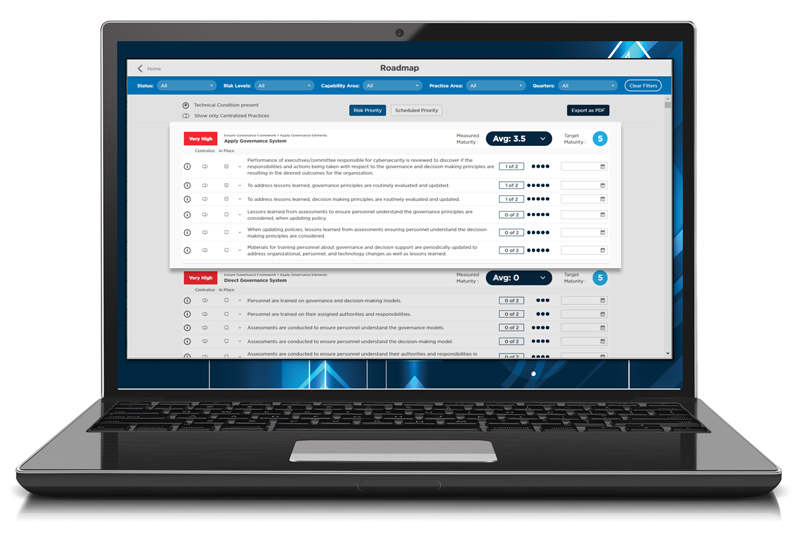 One of the most important aspects of the CMMI Cybermaturity Platform is the risk-based roadmap—a customized list of action items prioritized based on the risks most relevant to your business. Identify and address your most critical cybersecurity weaknesses. Prioritize cyber initiatives to strategically improve maturity and resilience. Plan, manage and support cyber investments with confidence. The roadmap is prioritized based on your organization’s biggest threats and risks. Results can be filtered in numerous ways, making it easy to isolate the information you want. Roadmap elements are organized intuitively, so you get a lot of information at a glance. Export any version of the roadmap as a PDF at any time to reference while offline.